Equinor (formerly Statoil) is Scandinavia’s largest company. We have always tried to be a values-based and human-centric organisation, ever since we hit the ground running in 1972 when oil and gas were discovered in Norway. During these great pioneer years, young people just in the door (including myself) were given huge responsibilities. Autonomy, empowerment, collaboration and trust were not necessarily conscious strategies. There was no choice if we wanted to catch up with the international giants that were already on the scene. During years of rapid growth, traditional management processes were also introduced. Brick by brick, this led to increased bureaucracy and rigidity. The gap widened between what we preached about values and leadership and what we practiced. Such gaps are poison in any organisation, making leadership messages hollow. What we do always weighs so much more heavily than what we say. It does not help to have Theory Y leadership visions if you have Theory X management processes. The growth journey of organisations shares many similarities with the aging process of man. As we grow older, we lose what we once took for granted: the agility, flexibility and idealism of youth. As age takes its toll, some become weary of life and lose their spirit and that twinkle in the eye. This development in the human body and mind is unavoidable and irreversible – at least the physical part. In the end age takes us all. Organisations, however, have a choice. They are not destined to become slow and sad places to work because they grow and become older. When they do, it is mostly self-imposed and cannot be blamed on destiny or an aging process. On the other hand, for man, older normally also means wiser. For organisations, this is not necessarily the case, as they struggle to capitalise on the collective wisdom and experience acquired during the growth journey. The solution is often another new process: “knowledge management”. Many employees instead experience a “dumbing down” trend, as they observe more and more strange decisions made further and further away from their own reality. Of course, one cannot manage a big organisation exactly like the small one it used to be. But could there be alternatives? Could there be other ways, ways which better balance the benefits of being big – which are both real and important – with the benefits of being small? Is there a way we can be small and big, young and old, brave and wise, at the same time? In 2005, we started out on a long journey to re-discover our past. We wanted our management processes to better reflect our values and beliefs. We also wanted (and needed) to make these better suited to deal with the massive level of VUCA (volatility, uncertainty, complexity and ambiguity) we were – and are – experiencing in our business environment. 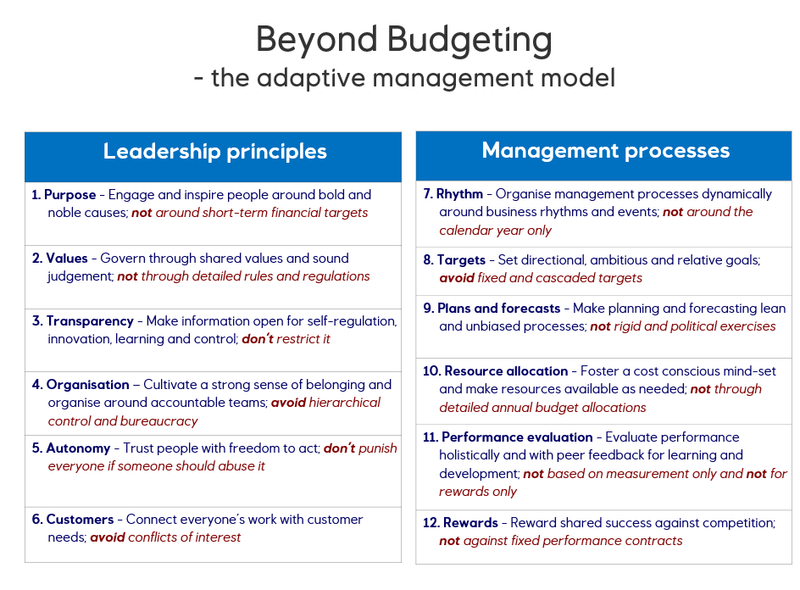 We found inspiration in “Beyond Budgeting”, a business agility model that is quite unique in how both leadership and management processes are addressed, and in how the coherence between the two is key. It should not be treated as a recipe, but in company with a number of other organisations around the world we use it as inspiration and guide as we try to become more adaptive and more human. We called our new performance process “Ambition to Action”. One of many initiatives was about kicking out the annual budget. This turned out to be a key lever. The budgeting process and mindset sit at the core of traditional command-and-control management. No organisation will achieve true agility without also addressing the budget. Dispensing with it was also a very effective way of signaling to all managers that we were serious about change. The process involved them all, and almost all of them loathed it. This is where “Beyond Budgeting” got its name from, but as the 12 principles demonstrate, the model is about much more than budgets. It is about being adaptive and human. It is business agility in practice. We introduced full transparency, opening (almost) everything to all employees. The main purpose was learning, but transparency can also provide (social) control on, for instance, spending levels. We also replaced the fiscal year rhythm with more business- and event-driven rhythms in many processes. We moved towards more relative and less absolute targets. There is, for example, no fixed corporate profitability target. It is all about doing well on a league table of eleven competitors. 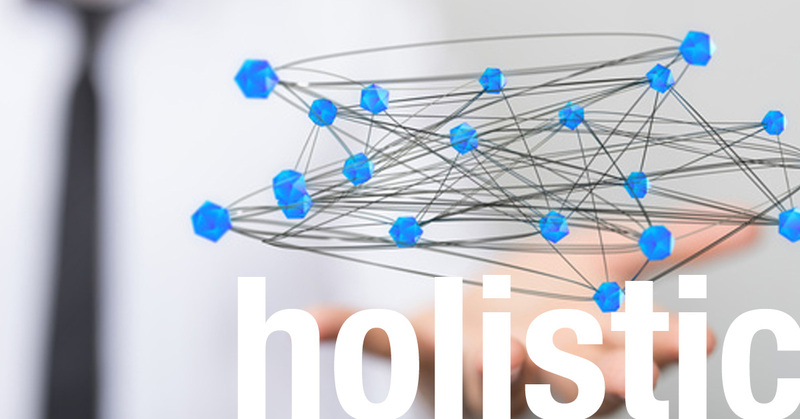 A holistic performance evaluation was introduced, where the weighting between what you deliver and how you deliver (our values) is 50/50. We also “pressure-test” measured business results, where we take into account hindsight insights, ambition levels set and sustainability of delivered results. Throughout our continuing journey there has been close cooperation between finance and HR. I am a finance guy myself, but I have also worked in HR. Gaps between what is preached and practiced in organisations are often caused by these two functions talking a lot about each other, but seldom with each other. This lack of communication and coordination can, and should, be turned into the opposite. Working together on these issues can be extremely powerful, creating integrated, coherent and credible performance processes. In doing so, we also ditched the label “performance management”, which is quite negative and it carries many illusions of control. Now we talk about enabling and developing performance. Language is important. Here is a link to a few other blogs that makes it all more concrete. Check out also the Beyond Budgeting Roundtable. I look forward to sharing and discussing our story and Beyond Budgeting at the 2018 Drucker Forum. Hope to see you there!